Mariners Sunday mailbag: Really, can Seattle make the playoffs? 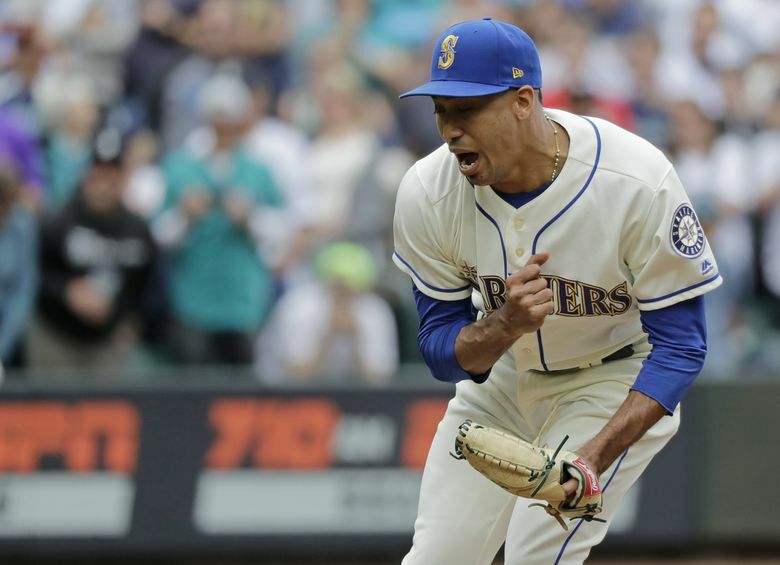 Edwin Diaz for AL Cy Young? If the Mariners miss the playoffs, what happens to the roster? Beat writer Ryan Divish weighs in on that, Dee Gordon's diet of In-N-Out, his strangest clubhouse story and more. Including the most-pressing question of all: Are the Mariners good? The Twitter mailbag finds itself mired in the dog days of August. While the Twitter questions are going strong, some of the answers are just dragging through the zone while others are feeling a little soggy and fatigued. But this the separator between the mailbags that aspire to be great and others that are willing to settle. How do you push through to finish strong? Well, that starts today. This is the time of the season where the thrill of the postseason — usually outside the Seattle area — can help you push through with a surge of adrenaline and a sugar-free Red Bull. By record, the Mariners are good. They came into Saturday with a 70-53 record, making them one of eight teams in the American League with a winning record. And if they played in the American League Central, they’d be battling it out with Cleveland Indians for the division title. If the Mariners were in the National League, they’d be leading the NL East and NL West. Only the Cubs at 71-53 have more wins than the Mariners. So by record, the Mariners are good. By stats, the Mariners are sort of good. Actually, they’re more middling. Of the 17 teams that had records above .500 going into Saturday, only the Mariners (-32) and Rockies (-16) had negative run differentials — less runs scored than allowed. It’s been written about often, but a negative run differential rarely if ever leads to sustained season success. The Mariners offense is below league average in runs per game at 4.16, which is 11th of 15 teams in the American League. They’re 10th in on-base plus slugging percentage (.724) and seventh in weight runs created. Their pitching is eighth in ERA at 4.14 and has allowed eighth most runs per game in the AL at 4.41. But really, the measure of “good” or success for this organization is ending a postseason drought that dates back to 2001. You may have heard this before, but the Mariners hold the longest active postseason drought for any franchise in the NBA, NFL, NHL or MLB. A winning season, which seems likely, will be nothing but a feckless moral victory if the team fails to qualify for the postseason this year, particularly after holding an 11 game lead over the A’s in mid-June. What needs to be done for the Mariners to surpass the Astros? Well, it’s looking like the Astros, not the A’s, could be the Mariners direct impediment from getting the second wild card spot. With their win over the Astros on Saturday, the A’s have moved into a tie with Houston atop the AL West. People lament the Mariners blowing an 11 game lead to the A’s, well, the Astros had a 12 game lead. Since June 15, the A’s have posted a 40-13 record, which has propelled him to their current position. Only the Red Sox, who also went 39-13 over that stretch, have had that sort of success. By comparison, the Astros are 28-24 and the Mariners are 25-28 over that time. Seattle hasn’t exactly given away its perceived postseason spot. It was bullied away by Oakland. Not to go all coach-speak, but the Mariners have to worry about themselves. They have to play better than they have the last six weeks. They’ve been inconsistent in the field and at the plate with costly mistakes and far too many at-bats given away. A starting rotation that that pitched at a high level in July wasn’t really rewarded and is starting to fatigue, while a beat-up bullpen is still struggling to navigate the seventh inning without allowing a run. Their magic in one-run games and late-inning comebacks has regressed as expected. Now it comes to playing at a higher level to find success. They have that capability, and have shown glimpses of playing to that potential, but it’s never been sustained for more than five to six games at a time. The Mariners need Kyle Seager to start hitting and getting more production from the bottom of their reworked batting order. They also need James Paxton to only miss one start and this few days of extra rest to reinvigorate Marco Gonzales. The schedule works toward their favor and against them. Seattle still has six head-to-head games with the Astros and seven with the A’s, meaning they can make up ground in those games. But they’ve also struggled with the Angels and Rangers, who they face a total of 10 times before the season ends. Do u believe the Mariners can win a one game playoff on the road wether vs Oakland or NY and would Felix see time In that game? I think when James Paxton steps on the mound, he has the capability of beating any team in baseball in any location. He’s that talented and that capable of dominating a team. No team wants to have to face the Mariners with Paxton lined up on five days rest and then having Alex Colome and Edwin Diaz available in the eight and ninth. That concept of being able to line Paxton up for that wild card start seemed plausible in June, but just making the postseason is in doubt now. If the Mariners are able to correct some of their issues and play at a higher level, it will likely come down to the final days of the season to decide their fate. As for Felix, unless something changes in performances from him or others, the Mariners would opt for Paxton, Leake or Gonzales to start a wildcard game instead. But he would likely be available in the bullpen. In trying to get Felix right, why hasn’t he gone back to the more pronounced twist in his windup that he had a few years back? He simply doesn’t have the core and leg strength and flexibility to use that delivery and repeat it on a consistent basis. That windup, which had a little tribute to Luis Tiant, was far from fundamentally sound. But Hernandez’s youth, arm speed and natural talent allowed him to make it work. But as he aged and didn’t maintain the strength needed, he was unable to find the consistent release point, leg drive and finish with that delivery. He had to simplify it to survive. Unfortunately, he still hasn’t found consistent command from any variation from his delivery over the last three seasons. If/ when "Sugar" blows the record for saves in a season out of the water, what are the chances that he will win the Cy Young award? Well, Diaz is on pace for 63 saves, which is one more than the record of 62 set by Francisco Rodriguez back in 2008. So he’s not exactly trending toward blowing it out of the water. But if he gets 63 saves, he’ll certainly get some votes for the AL Cy Young award. But will he win it? The last reliever to win a Cy Young was Eric Gagne in 2003 when he saved 55 games with a 1.20 ERA for the Dodgers. The last American League reliever to win the award was Dennis Eckersley back in 1992. Eck also won the MVP that season for the A’s. When Rodriguez set the award in 2008, he was third in the Cy Young voting. Cliff Lee, who went 22-3 with a 2.54 ERA won it easily. The last reliever to garner votes in the Cy Young was Zach Britton, who finished fourth in 2016 after saving 47 games and posting a 0.54 ERA. Diaz is certainly worthy of some consideration, but voters have changed their opinion on voting for relievers for the Cy Young. But Diaz’s candidacy may be more about the competition as well. Boston’s Chris Sale and Cleveland’s Trevor Bauer are the top Cy Young candidates, but both are on the disabled list right now with respective injuries. The length of those stints could be detrimental to their hopes. Houston’s Gerrit Cole and Tampa’s Blake Snell also outside candidates. But with no pitchers pulling away, some voters may consider Diaz, particularly if he does reach the 60 save plateau. Is Ichiro coming out to celebrate after wins weird or does everyone on the team not think about it? One of the stranger personnel decisions you’ve seen? I think we are passed the point of weird with the Ichiro situation in June. In the first few weeks, it was beyond bizarre. But now you get used to him being in uniform, taking batting practice, shagging fly balls, running wind sprints and never playing in the game. He was in full uniform — not a suit — for team pictures on Saturday. The reward for Ichiro will be next season when he plays in Japan with the Mariners in those first two games of the 2019 season with the roster expanded to 28. What will be interesting is what happens when the Mariners come back to the U.S. and have to whittle their roster back down to 25. Will he retire? Will he go back to his special assistant to the chairman job and keep practicing for games he’ll never get to play in? If, and it's a huge if, Mariners don't make playoffs this year, what should (or can) the Front Office focus on during the off season? It’s not a huge IF any longer … their entire status about not making the postseason has been trending from “if” to “when,” which isn’t exactly inspiring for fans. If or when the Mariners fail to make the postseason, the initial focus will be on designated hitter Nelson Cruz and the decision on whether to offer him a contract extension to keep him in the organization or if they decide to move on. Cruz, 39, must also make the decision on whether he wants to return to Seattle or try to find another situation perhaps with a better chance at the postseason. Because of his age and being relegated to a full-time DH, he’s limited to American League teams as a possibilities. Also working against Cruz is that more and more AL teams are also moving away from the every day designated hitter in favor of using that spot to rotate in various players instead. Still, there are several teams that would happily take a chance on a hitter that is a lock to produce 30 homers and .900 OPS while being a positive clubhouse influence. Carrying a full-time DH that isn’t capable of playing anywhere else — even for a game or two —does create flexibility issues with the roster. It’s something the Mariners have dealt with this season. Once they make a decision on Cruz, the other decision will be with Dee Gordon and whether they move him back to centerfield full time or leave him at second base and move Robinson Cano to first base. If they keep Gordon at second, they’ll have to go out and find an everyday centerfielder. Those are two roster-shaping decisions that need to be solved before really addressing additions to the rest of the position player roster. The Mariners entire rotation is under contract for next season and they’ll return a large portion of their bullpen with only David Phelps and rentals Adam Warren and Zach Duke headed for free agency. General manager Jerry Dipoto will obviously add pieces to the pitching staff. But will they be complementary pieces, or will it be a significant add? I have it on good authority that Gamel once said he didn't like Weird Al's music in an interview and it just so happens that Weird Al is Servais' favorite artist, and that's why he hasn't been brought up yet despite destroying AAA pitching. Can you confirm this? I can confirm that manager Scott Servais is not a big Weird Al fan. But Times’ columnist Matt Calkins is a big Weird Al fan. This is not made up. Matt has surprising knowledge of Weird Al and his song lyrics. As for the Gamel situation, they’ve made their reasoning for not adding him very clear. Gamel’s absence from the lineup isn’t going to fix their offensive issues. Unless Gamel can suddenly get Seager, Zunino and Healy hitting consistently. In honor of Gordon estimating he’s had 280 burgers from In-N-Out this year. What are the most impressive or weird dietary habits you’ve come across covering MLB? Alfonzo reached into his locker and pulled out an old clear booze bottle with some murky brownish liquid in it — supposedly a liquor of sorts. But soaking inside of that bottle of unknown liquor was a large snake curled up in the base. Alfonzo claimed it was a poisonous snake that was put into the liquid alive and then later died in the bottle. He grabbed a sizable shot glass from locker, poured a healthy amount of this cloudy liquid into it. It produced a wretched smell. Alfonzo raised the glass and guzzled it down. Alfonzo offered snake juice to others, including me. No one took him up on it. “This is better for you than a protein shake!” he exclaimed. The next year he was suspended for 100 games for a second positive PED test. So maybe snake juice had a little more than a dead snake in it. In the course of your work has an athlete, coach, executive, etc… ever said anything really mean or rude to you? Jeremy Reed and I had a mutual dislike of each other that was maintained for the better part of three seasons. Adam Jones once told him to shut up as he heckled me while interviewing Jones. When I was an intern, Alex Rodriguez once put “Who Let the Dogs Out” on the clubhouse stereo on repeat and played it as loud as possible while we tried to interview him. Chad Ochocino once asked me what game I was watching. I wanted to reply, “the game where you had one catch for five yards and three drops” … but I didn’t. Is MLB considering changing blackout rules for https://t.co/vhmlzprcBD? That would make far too much sense. But most teams are also against it since they own their regional sports networks. So it wouldn’t be of financial benefit teams. There has to be a way to make it beneficial for all sides, perhaps an adjusted or increased streaming fee for in-area games. But instead, MLB will probably just make another deal for more Facebook exclusive games and worry about mound visits in a game. How is life as a beat reporter? Would you rather be doing something else? Life as a beat writer is absentee, nomadic, sleep-deprived, unhealthy, well-traveled, enjoyable, challenging, frustrating and rewarding. There are few days where I dislike the job. Obviously, there are aspects that can be infuriating, but the good things vastly outnumber the bad. As for doing something else, I’m old now. I can’t sing or play an instrument. I can’t seem to buy a winning lottery ticket and I can’t afford to live in Hawaii and become one of those old dude surfers. So, no, there really isn’t anything I’d rather be doing. Well, maybe, a professional fly fisherman. Do those exist? The Tat’strami from Tat’s is closer runner-up. I still have to try Delicatus and HoneyHole before coming up with a more definitive list. Should I start the keto diet ? I don’t think I’m the best person to speak about the benefits of a keto lifestyle. Should I splurge and buy $70 Jason Isbell tickets? I plan to. I will see you there. Based on your knowledge of Big Sky football, does Central have any chance of beating Eastern Washington. Feel free to confer with Tim Booth. If Central somehow beats Eastern, I will wear a CWU hat at least once a week for the rest of the year. And treat you and Tim to a free meal at The Tav in Ellensburg. What are your top three man movies of all time? Was the Pearl Jam concert in Montana really the best show of the 3 last week ? I didn’t get to see any of them. You know this, and you are just causing me further pain.